From the 1890s to the end of the 1920s, San Antonio's popularity as a winter resort and tourist destination enriched the local economy. However, the hardships of the Great Depression (1929-1939) and World War II (1941-1945), soon dried up the tourist trade. The WPA-funded projects undertaken between 1939 and 1941 to create the River Walk and to restore La Villita initially failed to become major attractions. Many credit HemisFair '68 - the 1968 world's fair held in San Antonio - as the catalyst for the city's modern advancement and its resurgence in tourism and conventions during the latter half of the twentieth century. The urban park where the fair took place, now simply called "Hemisfair," is no stranger to transformation. Its 18-plus acres, repurposed through urban renewal, lie at the southeastern edge of downtown San Antonio. 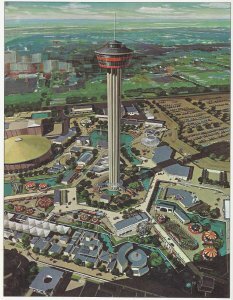 Before today's parkland became an international attraction - the only world's fair of the 1960s held in the South and the only one ever hosted by a Texas city - it was home to a beloved neighborhood, rich in layers of history and culture. This exhibit tells the story of both places, focusing on what locals gave up to create HemisFair '68, and what they gained in return. 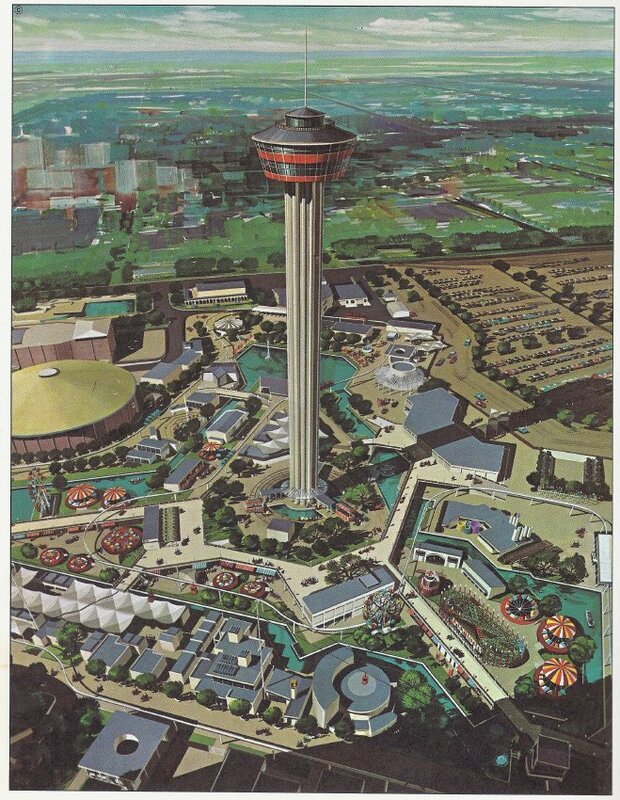 The unique collection of 1960's architecture that remains on site today represents one of the most intact of the modern world's fair sites and makes up an irreplaceable part of the fair's legacy to San Antonio. These buildings serve as monuments to an event that brought national and international acclaim to our once dormant city, and because of their masterful design, qualify for listing in the National Register of Historic Places: the nation's highest historical honor. The exhibit consists of 16 pages. The images are interrelated, so to get the full story, we recommend going in order from start to finish. However, you may click the Table of Contents to select any image to view. History & photo documentation was compiled by Librarian Beth Standifird and Consultant Elizabeth Pople, with contributions by Larsen Andrews, Jerrie Bethel, Lee Grant, and Lynne Hendry. Content may not be copied or reproduced without permission of the San Antonio Conservation Society Foundation. 2017 San Antonio Conservation Society.